It is that time of the week. The time when I do my very best to break down the upcoming Vikings game and try to predict the future. Last week my accuracy was comparable to Paris Hilton trying to parallel park, but this week I’m positive I’ll hit the nail right on the head. Last week I had no complaints about the performance of Adrian Peterson other than the fact that they stopped calling his number in the second half. It sounds like Peterson and offensive coordinator Darrell Bevell agree with my assessment of the playcalling against the Saints. This was only the second game of Peterson’s career where he wasn’t handed the ball once in an entire quarter when the score was a one possession margin. Peterson is essentially playing for a new contract and also to reclaim his status as the league’s top runner. He says he would be happy to get 40 to 50 carries per game. “I have faith in my offensive coordinator that he’ll do a good job of balancing out the offense and we’ll be productive in the long run,” Peterson said. One thing Peterson didn’t do on Sunday was fumble, something which has been discussed in great detail over the offseason. “I was doing my job keeping it high and tight and handing the ball back to the ref,” he said. The Dolphins showed on Sunday that a team possessing three great running backs isn’t enough to get past them. The allowed the Bills stable consisting of CJ Spiller, Fred Jackson and Marshawn Lynch to only rush for a combined total of 38 yards on 14 carries. We know these guys can run, so the obvious thing to point at is the competence of Miami’s run defense and the incompetence of Buffalo’s offensive line. The Dolphins will be facing an offensive line that is more battle tested than Buffalo’s but has not been without criticisms of their own. The Vikings hope that John Sullivan getting a full week’s worth of practice will make this run game even more potent than it was in the first half of the Saints game. Injuries have thinned out the Dolphins defensive line a bit, but free agent acquisition Karlos Dansby has given this unit a new pep to their step. Nose tackle Randy Starks received a lot of praise this week following the victory against the Bills, but he was only in on one tackle and isn’t someone that particularly scares me, even with a hobbled John Sullivan at center. The Vikings had Albert Young as the primary backup to Peterson in week one, but Toby Gerhart is on the mend and may be able to appear this week. Seeing rookies Gerhart and Chris DeGeare on the field may go a long ways towards making this run game even better. 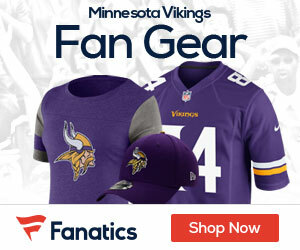 Young’s performance on Thursday was less than great and had DeGeare been active when Bryant McKinnie left the game with an injury, perhaps the Vikings would not have abandoned the run. Player To Watch: I hate to be “Captain Obvious” here, but the player to watch is clearly Adrian Peterson. He expressed in no uncertain terms that he is hungry for carries and his violent performance against the Saints may have just been a short glimpse of what we can expect from him from this point forward. I painted a fairly exciting picture about the run game, but that could all go out the window if Brett Favre and the Vikings don’t get their act together. The best way to make the run game succeed? Neutralize Karlos Dansby. The best way to neutralize Dansby? Make sure Visanthe Shiancoe beats the Dolphins up the middle early and often. Shiancoe was clearly up to the task of filling in for Sidney Rice’s absence in week one, even if the rest of the team, as the tight end led the team with four catches for 76 yards and scored the Vikings only touchdown. All of the actual wide receivers only had one catch a piece. Adrian Peterson was the second most productive receiver on the team, catching three passes for 14 yards. One good thing about their first game is that the offensive line did a decent job protecting Favre. He was sacked once and pressure forced his interception, but for the most part the line held pretty well. The downside to that? They were mostly facing three man fronts and blitzes were not very frequent. The Dolphins could possibly try a little harder than the Saints did to get at Favre. Even with first round rookie defensive lineman Jared Odrick the Dolphins present a pass rushing challenge. Cameron Wake has proven to be a specialist at getting to the quarterback, while tricky blitzing schemes and solid play on the perimeter have allowed them to have success in this area. The strength of the Dolphins defense is certainly in the front seven, but if the Vikings can find time for Favre to throw then they may be able to take advantage of a young but suspect Dolphins secondary that was unable to force any turnovers against a Trent Edwards led offense. The Vikings need better performances out of their wide receivers and they also need Brett Favre to finally shake off that rust. If they can get on the same page in week two, then the Dolphins defense could be in for one long afternoon. Player To Watch: It was only a few weeks ago that Greg Camarillo was a Dolphin. In his first game as a Viking he played only seven snaps as moving into the Vikings system was essentially like trying to learn a new language. His catch on a corner route was one of the Vikings rare passing highlights against the Saints and was good for 29 yards. Having the long week to prepare for the Dolphins has provided Camarillo the opportunity to learn the new language that is the Vikings playbook, and I think he is a guy that sounds ready to take on his former team. The Miami Dolphins two headed monster made up by Ronnie Brown and Ricky Williams is one to be respected, if not feared. Unfortunately, this matchup against the Vikings has to be a nightmare for them. Let me explain. Until the WilliamsWall starts string together multiple sub-par performances like the one on opening weekend, I am not going to consider them anything other than the best in the business. When you look at the terrible interior line of the Dolphins, it is safe to say that Ricky and Ronnie will be aiming to run to the outside more often than not. I would. Especially with E.J. Henderson waiting behind the Williamses for them to sneak through. So, whether they use the Wild Cat offense or not, I really expect the Dolphins running game to focus on exploring the outside. We all know that Jared Allen and Ray Edwards are no slouches against the run, not to mention Chad Greenway and Ben Leber seem to be getting even better and better at reading, reacting, and bringing down the runner. If you extend even further outside, you’ll find Antoine Winfield waiting to shut down his half of the field completely, as he is known for doing so well. That means that the Dolphins will probably target the side of the field occupied by Lito Sheppard or Asher Allen most frequently. With safety help on these long developing plays, in addition to our front seven’s ability to play sideline to sideline, this doesn’t pose much of a threat in my mind. While I really do think that Dolphins running game is in for a very rough day, that isn’t to dismiss the possibility of a few big plays gouging the defense. I entirely expect a lot of famine for Ricky and Ronnie, but wouldn’t be surprised to see them feast on occasion. Player To Watch: If I had to choose a defensive MVP from Thursday’s game against the Saints, I would have given it to Chad Greenway. Greenway led the team with 12 tackles, and showed much improved abilities after a 2009 season in which he struggled greatly with finishing tackles. With his range and skill, he could be the answer to the question of how the Vikings can completely stuff the wild cat. Brandon Marshall is 6’ 4” tall. If Chris Cook and Cedric Griffin are unable to play again after both missed the opening game, that means the Vikings tallest cornerback will be Lito Sheppard at 5’ 10”. Obviously this could be a problem. Even if Cook and Griffin are healthy enough to play, putting an untested rookie or a guy coming of an ACL injury against one of the league’s absolute best receivers (and biggest morons) could be disastrous. 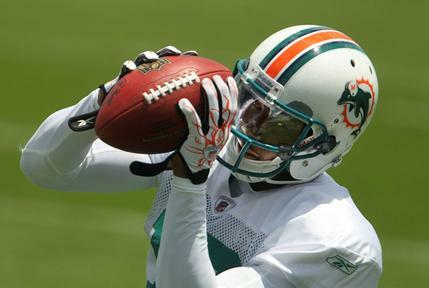 Marshall also has a pretty good supporting cast around him made up of Davone Bess, Brian Hartline, and Anthony Fasano. None of these guys are really the above average threat that Marshall presents, however. Even if double-covered, I think Marshall is clearly the most potent threat to the Vikings defense, even with all hands on deck. The Vikings have to play Marshall smart. With their new found willingness to move Antoine Winfield around the field more, I personally think he needs to follow Marshall around as he is our smartest defensive back. Winfield, however, is not the best cover corner in the world and is still going to need adequate support over the top. It is time for Madieu Williams and Husain Abdullah to prove that they deserve to be where they are. While hoping for miraculous coverage from the defensive backs is nice, the reality is that the pass rush is going to be key to keeping Marshall and all the other receivers in check. Jared Allen has drawn criticism for disappearing during road games, but luckily for us, this is a home game. He needs to do his thing and get the crowd in a frenzy, rally his linemen teammates, and scare the heck out of poor young quarterback Chad Henne. This will not be an easy task for Allen, as he will be lining up against arguably the league’s best pass blocking left tackle, Jake Long. Allen must find a way to disrupt the passing game despite the tough matchup, and Ray Edwards has to find a way to abuse Vernon Carey on the other side. If the Vikings can’t get to Henne, this could end up being Brandon Marshall’s best week of 2010. Player To Watch: I had real issues with Asher Allen’s performance in week one, to the point that I was willing to single him out despite a variety of poor performances to choose from. He’s going to have a more manageable matchup this week while assigned to the likes of Davone Bess and Brian Hartline. Allen has shown flashes of big play capabilities and a knack for making the big hit. My guess is that he’ll be an important piece in the puzzle when it comes to stopping the pass attack and also keeping the Dolphins from being able to run outside. Keep an eye on the youngster as he is still in the process of making a name for himself. With Ted Ginn Jr. out of the picture in Miami, they appear to have a merry-go-round of return men that proved to be unproductive in week one. Clifton Smith was used the most but he only managed 15 yards on a kick return and a total of eight yards on two punt returns. The Vikings coverage unit (not to mention Chris Kluwe) appeared much improved in week one, and Sunday will be the next step in proving they are a consistent unit worthy of being trusted. Dolphins kicker was two of three in field goals last week, hitting from 43 and 32 yards. He is a somewhat reliable kicker, but not to the same degree that Ryan Longwell is. After a shaky and unimpressive start to the season, the Vikings return men (presumably Percy Harvin on kicks and Bernard Berrian on punts) could rebound and have a big play or two, but it will be tough trekking for them yet again. The Bills C.J. Spiller returned one kick for only 11 yards, and Roscoe Parrish only managed 10 yards on three punt returns. Despite some bright spots, punter Brian Moorman averaged only 38.4 yards per punt against the Bills while Chris Kluwe averaged 44.3 yards on his punts. If this game is close enough to be decided by the explosiveness of return men, field position battles from the punters, or a clutch kick then the Vikings may have the advantage in this area. Player To Watch: Much was made about whether or not the Vikings would keep kickoff specialist Rhys Lloyd on the roster for the season. They ended up cutting him after a poor showing in the preseason, and the kickoff duties are once again Ryan Longwell’s responsibility. Longwell was not happy when the Vikings signed Lloyd and it will be interesting to see if his assumed inability to kick the ball deep has any negative effects on the Vikings. Regardless of kickoff productivity, Longwell is always a key player on special teams and often a difference maker when it comes to winning or losing. The Vikings have only played the Dolphins 10 other times int eh history of the franchise, and have won four of those games. The last time they played each other was in 2006 and the Vikings lost, 24-20. Brett Favre broke a record previously set by Warren Moon for a quarterback of 40 years of age or older. After turning 40, Moon threw 25 touchdowns prior to retiring. Favre now has 26 touchdowns since, and continues to work on setting a new high-water mark. Someday, maybe we will see the likes of Peyton Manning or Tom Brady chasing this record. The Vikings will be wearing their throwback uniforms for this game, which is awesome. They really need to just go back and wear these on a full time basis. They’re so much better than the current uniforms. One thing I have to give the Dolphins credit for is their coaching and their discipline. In week one (a week where penalties are typically plentiful) the Dolphins only had three penalties for 15 yards. The Vikings had six penalties for 60 yards, but that really isn’t too bad considering the hostile environment they were playing in. Many of the predictions I have seen call for this game to a close defensive battle. I personally think this matchup lends itself to major holes being exploited in each defense. The Vikings have the power of Adrian Peterson and the presumably more efficient passing game to get them into that weak Miami secondary on multiple occasions come Sunday. Meanwhile, the Fins have the left tackle talent to contain Jared Allen and a receiver that could cause fits. That is why I think this game ends up being a little higher scoring than most think it will. Good summary Adam. We have the better team, but what happens on the field is all that matters, and better teams lose quite often. I hope Favre has done some hookin’ up with his receivers this week and our D-Line has the Miami run game scoped out. That’s what has us at 0-1. And I sure wish our top corners were ready to go. I sure agree with your MVP. I don’t think we’ve seen the best out of Greenway yet. The guy just keeps getting better. Sure worried about our D-backs trying to defend against Marshall. The guy is just too big for our little dudes. I see that Bevell seems to be taking the blame on not playing AD in the 2nd half last week. I wonder just how true that is? It’s never been made very clear who is calling the offense. Sure looks like Childress to me in most cases. If it was Bevell’s call, that tells me we’ve got two dummies running the offense. By the middle of the 4th quarter, if I’m Childress, I’m calling Bevell over and asking him what the hell is wrong with AD and why aren’t you playing him?